We are a leading Manufacturer of acoustic hanging baffle and round acoustic hanging baffle from Ghaziabad, India. We are an acclaimed name indulged in offering our patrons a superior quality range of Acoustic Hanging Baffle. The acoustic baffles are useful for many different types of area i.e. industrial shop floor, Canteen, Meeting rooms food processing areas, indoor stadium. All the sound baffles are fitted with hanging system used for vertical suspended OR horizontal suspended from the ceiling. These baffles are light weight and do not add any extra load on ceiling / roof truss. 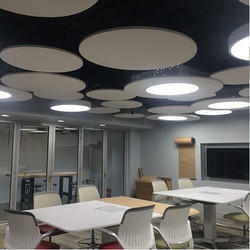 Because of our dexterous team of professionals, we are involved in providing a wide array of Round Acoustic Hanging Baffle. Best suited for noise and reverberation control in large spaces with high ceilings. 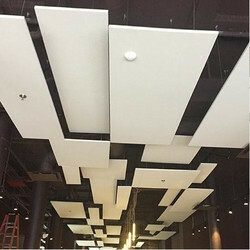 These acoustical clouds are designed to reduce echo in areas such as Auditorium, Lecture Theater, gymnasiums, multi-purpose rooms, and other high ceiling spaces. They can be suspended from the ceiling / truss as vertical baffles or horizontal clouds. Looking for Architectural Acoustics Services ?